1) Talk to him, ask him to 'take it easy' and choose to offer him a drink. 2) Go buy a Tropical Sograt from the Bartender in the Bar located at Northwest corner of Morroc. It cost 1,000z each. Bring him the drink. 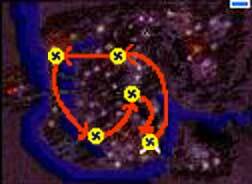 3) At this point, you have to finish the Wandering Bard Quest and come back again. The Wandering Bard Quest is a requirement of this quest. Requirement: You must be job level 40 or higher. The Morroc Bar where you bought the drink in step 1. After doing the wandering bard quest, he will recognize you as a friend of Errende. Ask him to teach you his skill, he will need you to bring him 5 Yhelle's Eggs. You can find Yhelle at the 5 marked co-ordinates in Niflheim. How to get to Niflheim? Look at the RO World Map. You can get a Kafra Teleport Service from Morroc to Comodo, then from Comodo to Umbala and from there walk your way to Niflheim. Yhelle can be found at one of the five spots marked on the map. It stays in one spot until someone found it then it warps to another one. It looks like the order of warping is in the marked order. You have to "catch" it and hope it give you an egg. There is only 1/3 chance you get one, the other times it just ran away. Note 1: You can ask friends to camp the spots, however only the bard that is doing the quest can get an egg. Note 2: DO NOT EAT THE EGG! You can only get 5. If you accidentally lost one (or more). Read the next step for a possible quick fix. See step 2 for location. Give him the eggs and he will teach you the skill. If you really got 5 eggs from Yhelle but eat/lost or whatever happened to them, he will offer you to find him a Munak Doll to make up for the missing eggs.